Like Part 1, Part 2 is framed by questions. These questions pertain to the body’s productive relationship with composition. According to the introduction, mediating bodies ^ mediated bodies” addresses the second of two assumptions that frame this book. Part 2, “mediating bodies ^ mediated bodies”, addresses “a tension between the felt experiences of an interior-being a body that composes, writes, and communicates- and a bodily exterior, of being one person among many, subject to study and impress from above or outside, mattering only because of one’s part in composing the many” (Arola and Wysocki 11). Part 2 includes pieces by new and established voices such as Kristin Prins, Ben McCorkle, and Kristie Fleckenstein. Kristin Prins addresses new ways to address embodiment in first-year composition courses by viewing composition as a craft. Prins asserts, “(Craft) invites us to carefully consider the social, historical, and material contexts of composers and users; the materiality of tools, technologies and texts and how we might differently engage those tools and technologies; and the social and ethical implications of the texts we produce and ask students to produce” (Arola and Wysocki 159). Prins asks us to consider the bodies and the worlds surrounding the bodies of composers, particularly student composers in first-year composition courses. Embodied composing as a craft, then, provides students with opportunities to compose in ways that allow their own bodies and identities to be expressed without modifying forms erasing the student from the student’s work. Along a similar vein, in “Whose Body? Looking Critically at New Interface Designs”, Ben McCorkle examines the implications of HCI- human interface design. Like Prins and other contributors to Part 2, McCorkle considers the physical body and its relationship to media and the composing process. McCorkle argues “for a more expansive notion of access so that it applies not only to the material availability of hardware and software, but also to the symbolic economy of interface design” (Arola and Wysocki 175). McCorkle asks us to consider the political and social ramifications of an interface design that demands a “normalized” body of its users. These essays are accompanied by similar questions about the physical body’s influence on the composing process and the media we produce. Jonathan Alexander and Jacqueline Rhodes examine sexual identity online in “Queerness, Multimodality, and the Possibilities of Re/Orientation” with two distinct topics placed side-by-side on adjacent pages to illustrate their relationship (Arola and Wysocki 188). Kristin Arola considers the complexities of self-representing as a mixedblooded Indian in online spaces, through the lens of regalia as identity (Arola and Wysocki 214). 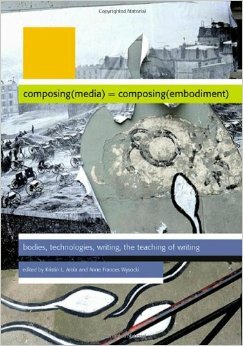 The essays in Part 2 consider the body’s relationship to media and the composing process through a multitude of lenses. The heuristics in Part 2, then, “ask students to consider how they are embodied through-shaped by and shaping-relations that media encourage” (259). Students are asked to consider the ways that they represent their identities online, and to consider the limiting influences of social media platforms on self-expression, for example. There is a hair’s breadth of difference between the goals of these heuristics and the heuristics of Part 1.